I want to write about needing nothing and receiving everything all the same. The bucket turned upright, empty and open, is ready when the rain comes, and so the sky lets go and the bucket fills and without even asking there is--just like that!--plenty. A supply. Supply. Supply that can provide later when the rains dry up. It is simple: the down-turned bucket receives nothing. It is simple: the full bucket takes in no more. It is only the upturned, empty bucket that receives, and I was that. Apparently, I was that. Broken? No. Not broken, but certainly surrendered. My resistances, weakened to the point of release: I had nothing to prove, and... held nothing? Possessed nothing? That's not exactly so, but I was empty handed and simple. Simple the way a novice is simple. Simple like a child, an infant, a newborn, which I suppose is to say All New. So when you walked into the corona of my day, sparkling eyes and dancing smile, I could cherish you. Not as a treasured object--not the cherishment as of a thing, no. But one who has lost everything, or at least feels she has, has nothing left to lose. I was simple, defenseless, unwoven weft. And so I smiled, approached, danced the dance of engagement, of animation in conversation, and then retreated. You stepped away, I stepped away, and we resumed our respective days in progress: a Saturday, I think. And the next morning was ordinary, just another morning of eggs on toast, and then the next and the next. But nothing would be the same. It would take awhile for each of us to recognize it, but nothing would ever again be the same. We were thrown like dice into a moment, we knocked against each other and turned up: one and one. Snake eyes. A lucky number. A fortunate combination. Life tossed us down like dice and we...added up. We matched. Nothing would be the same because something had been born; and though, yes, a born thing can die, it cannot ever be unborn. A life was set in motion. It is thriving now because we give it our breath, our joy, our hearts and dreams and truest intentions. We give it our cherishment. tation of these. White blankets everywhere warmed us all winter in those days. And Jackie Gleason could be both fat and famous and my father would still be awake most nights yet still far from us. How can a man sitting in the same room be so far? Behind those eyelashes, eyes, and behind those eyes, a brain, fueling a heart and soul. But I wouldn't really touch these until he'd slipped entirely past them--just past them: heart, brain, eyes, breath, lashes. It was over but just beginning and then completed, all in the same series of...how many minutes, two? three? five? seven? Not long, I can tell you that. And I can tell you too that lives change in such moments, in a matter of minutes, just like that, the world can turn. He was a dark presence in the other room looming. Or he was forcing olives on us or stinky cheese or horseradish. Or he was squeezing lighter fluid from a can onto pillows of black charcoal to ignite them, preparing chickens to rotisserie over their heat summer Sundays. Or he was fashioning long-handled, two-pronged aluminum toasting sticks for our marshmallows, for after the meal when the coals had gone gray but still glowered with their internal heat, that which remained. And I think now: that's how it was. The gray, the heat, the rising, the transformation from solid to nothing. But not nothing really. No, not nothing at all. To clarify, Kathryn, the primary roles of LOVE are not to heal, fix, or mend. Not to soothe, cure, or ease. Not even to refresh, rejuvenate, or restore. Hardly. 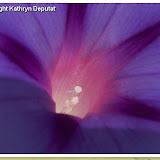 The primary roles of LOVE, Kathryn, are to "Yahoo!" "Yeehaa!" and "Whoohooo!" [p.s. - ] You were born to love, Kathryn, no matter the cost, no matter what someone else said, and no matter how the past once played out. I love it when the lens of my day spontaneously focuses upon evidences of Love having Its way in the world (no surprise, right?) I realize one need not ever look very far to find them; they are ever-present. Still, I want to share a few bits of evidence that crossed my path recently. These stood out for how they inspired me--so much so that I'm thinking I'll devote at least one entry a month here to highlighting such evidence in the world. So often it's the "bad" news that makes the headlines. May this focus help to balance that. "Grief is an issue that affects all of us at some point in our life (sic). It challenges us at our very core...and we feel tremendously alone. My Loving Tribute...is on Online Support Community where people grieving a loss can connect with others who are going through a similar experience." What a beautiful way to keep Love in motion. (2) I learned from a friend about the Yann Arthus-Bertrand project he calls "6 billion Others." "Thought of you when I stumbled upon this..." was the subject line of her email. I was curious, so I clicked on the link immediately. I was moved to tears by what I found there. Go, have a look--if only to be reminded that each of us has a story, a heart and soul, a life worthy of dignity. Go and listen, if only to be reminded that no matter how different we appear on the surface, we are more similar than we might think. Go to have a visit, from the comfort of your home or office or library or café chair, with others in our extended human family. It's gorgeous, it's brilliant, it's inspiring--its heart beats with the pulse of Love, or so it seems to me. ...join Kate in the process of creating a new series of songs based on love stories submitted by you, her fans. These stories can be about any kind of love: love of a city or street, love for a character in a book, love of a season, unrequited love, false or true love. ...All participants, whether choosing to submit a story or not, can be part of the “Spread the Love” team. How cool - and creative! - is that?! And speaking of spreading the Love, you are invited as always to share your stories right here on Love's Freeway. Tell us how Love has had Its way with you this week, this month, this year. Let's keep tipping the scales in Love's favor. It's gone. I still can't believe it's gone. I keep thinking it's just hiding in there, somewhere between the ever-expanding Siberian iris bed and the wild rose. But no. The one true and perennial bleeding heart, one of the first harbingers of spring in my garden, has apparently crossed the threshold of death's door before I even knew it was approaching it. There were no signs last year that I should anticipate this. Our winter was rather nondescript: not especially harsh, not especially dry. Perhaps it was just its time; perhaps it had lived to its full capacity. Do perennials just stop living? 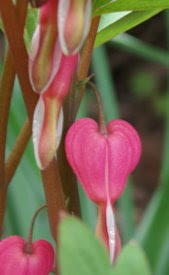 And too, bleeding hearts drop seeds every year; new seedlings under their skirts are not uncommon. But there's nothing, not a single scrap of bleeding heart, old or new. And this registers as an absence for me, a loss - however infinitesimal in the grand scheme of things. My love for it, alongside my incredulity over its disappearance, are what provoke me to write. My first impulse, once I accepted that it was not returning from dormancy this year, was to want to pay tribute. Those stems of heart-shaped, evocative flowers were teachers to me these past two springs. They invited, caused me to pause to look, and then to pause and look closer still. I even wrote about that in this column, about the seeing, the seeing more when I stopped expecting to see what I thought I would see when I looked at them. I feel as if I've lost a friend. Crazy perhaps, but it's true. And maybe it is because of their having changed me that this is so. No living thing that contributes to our lives is ever forgotten, yes? Any being, any thing that changes me, especially for the better, I hold dear. So it should come as no surprise, this missing, this sense of an absence. What does surprise me is the surprise at its absence. Did I expect this plant would live forever? Do I expect my perennial iris, poppy, peony, evening primrose will live forever? Apparently I do. Even in death, the bleeding heart teaches me. Reminds me. It would seem that this is a fact of life that bears repeating--repeatedly: that all is fleeting. I know I won't live forever, that you won't live forever. The maple tree just six or eight feet from this newly barren patch of garden: it died and was removed two years ago. But then, the "street trees": they're dying off one by one. The winter salting of the roads? So this one's passing was no surprise. Yet all the other bleeding hearts in my neighborhood are thriving, so...? We know it, but do we live it? I know when I am and when I am not living it. And I know this: things get very precious very quickly when I pause and know that the beloved before me may be gone tomorrow. Instantly, "I love you, Sweetheart" transforms from words articulated, from word forms to...heart forms. Love is lived then. Not spoken, but lived. And it is palpable, the difference; to each of us it is palpable. I call this cherishment. Cherishment is not about insuring against regret. 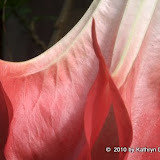 But I can say there is peace in knowing that I cherished the bleeding hearts, thanks to Love's Freeway and the quality and depth of seeing, of listening that it is drawing from me. They are lost, they are gone and I miss them. But there is no mistaking that I loved them, and I will continue to love them by way of their likenesses for a long time to come, grateful for their gifts to me, to us all.